Sgt. 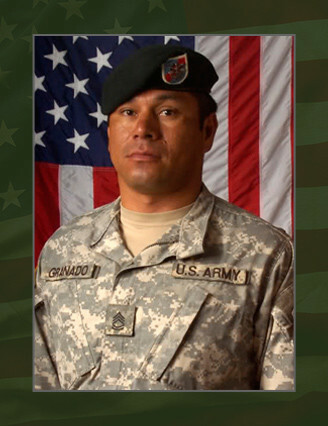 1st Class Alejandro Granado, died while conducting combat operations in the Qole Gerdsar, Afghanistan, Aug. 2, 2009, while serving as a Special Forces Communications Sergeant, Charlie Company, 2nd Battalion, 20th Special Forces Group (Airborne), in Jackson, Miss. Granado, 42, was killed when a command wire improvised explosive device struck his vehicle while deployed to Afghanistan in support of Operation Enduring Freedom. Granado, born in Ciudad Acuna, Mexico, enlisted in January 1988 as a 13B, Cannon Crewmember. He later attended the Special Forces Qualification Course, graduating in 2002 as an 18E, Communications NCO and was assigned to 2rd Bn., 20th SFG(A). Granado is a veteran of Operation Desert Storm and Desert Shield with the 3rd Armored Division and also deployed with the 20th SFG in support of both Operations Enduring and Iraqi Freedom. Granado’s military education includes the Basic Airborne Course, Special Forces Intelligence Analyst Course, Special Operations Interdiction Course, Air Assault Course and Unmanned Aerial Vehicle Course. His awards and decorations include the Army Commendation Medal, Army Achievement Medal, Valorous Unit Award, Army Good Conduct Medal, Joint Service Achievement Medal, Southwest Asia Medal, Liberation of Kuwait Medal, National Defense Service Medal, Armed Forces Expeditionary Medal, Afghanistan Campaign Medal, Iraq Campaign Medal, Global War on Terrorism Expeditionary Medal, NATO Medal, Non-Commissioned Officers Professional Development Ribbon, Army Service Ribbon, Overseas Service Ribbon, Driver and Mechanic Ribbon, Mississippi War Medal. Granado also earned the Combat Infantry Badge, Air Assault Badge, Parachutist Badge, and the Special Forces Tab. Granado is survived by his daughter Amanda and sons, Hasson and Alejandro, who reside in Longview, Texas.